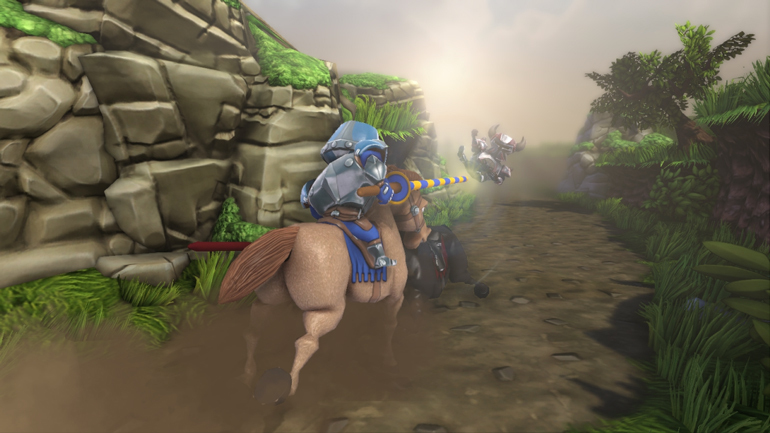 Just because jousting game Last Knight has a colorful cartoon-style and larger-than-life characters, you shouldn’t make the mistake of thinking the game is easy or childish. Its creator, David Hagemann, worked hard to keep the game simple to play, but challenging to master. There are few second chances: no health points to be replenished, no pausing once the joust is underway, and the ragdoll physics ensure that when you bump into something the results can be devastating. Hagemann is a veteran of Epic Games’ $1 Million Intel Make Something Unreal Contest, having seen his Unreal Tournament 3 characters (gene-mutated mice and monster bunnies) come first and second in the character category in the mod competition. Experimenting with Unreal Tournament 3 led to a career as a freelance 3D artist but his ambition was always to make his own games. It was the release of the free Unreal Development Kit (UDK) that prompted him to start working with Unreal again, and he began work on the game that would become Last Knight. Musician Edouard Brenneisen and sound designer Jarno Sarkula came on board early on as the game grew in scope. The graphics in Last Knight are considerably more complex than they look – a lot of work went into creating that effortlessly simple visual style. The game environment was sculpted in ZBrush and then the high-res meshes baked to low-poly meshes with normal maps and ambient occlusion bakes. The game also makes full use of Unreal Engine 3’s Lightmass global illumination which was deftly implemented in the randomly generated game world. All kinds of post-process effects were used as well. “In the Knightmare levels I kind of went nuts with it; I used the material system to bend the whole world in different ways, literally,” Hagemann says. 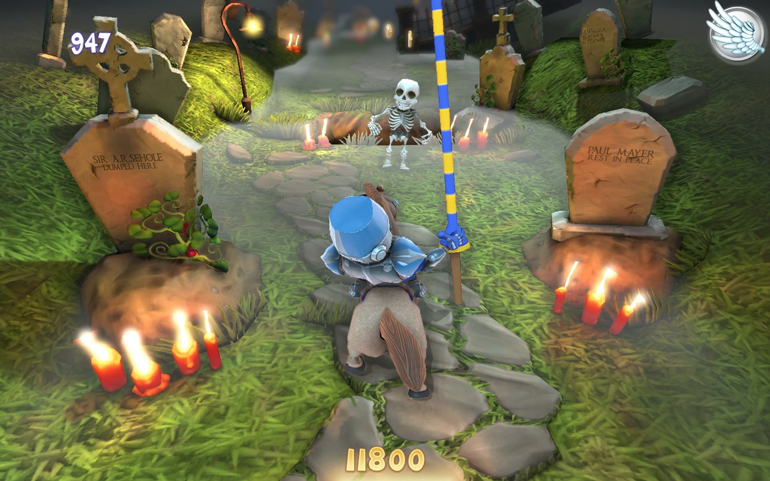 Last Knight might look bright and colorful, but there are some dark and sinister characters: skeletons rise from their graves, giant toads swallow the heroes, and there’s an army of lunatic Horned Bucket Heads on the loose who are always ready for a joust to the death. “I wanted to create a look that was reminiscent of older, stylized 3D platform games but which used all the graphic possibilities of Unreal Engine to make a detailed and rich environment,” says Hagemann. The Steam release of Last Knight: Rogue Rider Edition is in early access and incorporates all the previous game updates plus some additional features and a brand new game mode, an open-ended kingdom generated for you to explore, to interact with its inhabitants, and with plenty of loot. Once you die – and be assured, life can be short in Last Knight – a new kingdom will start afresh the next time you play. With this plus the Story and Endless modes, the Steam release has absorbing and varied gameplay. Be sure to keep up-to-date with all things Last Knight by following Toco Games on Twitter at @TocoGamescom!